Yabby Lake Vineyard sprang into public prominence when it made history by winning the coveted Jimmy Watson Memorial Trophy for Best Red Wine of the 2011 and 2012 vintages. It was the first time in its 52 year history that the Jimmy Watson Trophy was awarded to a Pinot Noir – a Yabby Lake Block 1 Pinot Noir 2012. This remarkable achievement was followed by accolades and awards for the Block 2 Pinot Noir 2013, which to date has already collected 11 trophies. And yet the vineyard is only 17 years old. When Robert and Mem Kirby bought the land in Tuerong on the Mornington Peninsula, they were not winemakers, but wine collectors who always dreamed of planting a vineyard. The land had the perfect conditions for growing high quality chardonnay and pinot noir – ‘hungry soil’ and a north-facing slope capturing both maximum sunshine and cooling sea breezes from 3 directions – Port Philip Bay, Western Port Bay and Bass Strait. It is this maritime climate that has turned the Mornington Peninsula into such a successful wine growing region. Tom Carson, joined Yabby Lake as General Manager and Chief Winemaker in 2008. Prior to that he was at Yering Station for 12 years during which time the winery won international acclaim including ‘International Winemaker of the Year’ at the 2004 International Wine and Spirit Competition in London. The Cellar Door and Restaurant opened only 2 years ago but is already recognised for its quality wine and food. Acclaimed chef Heston Blumenthal brought his family for lunch and Melbourne fine dining restaurant Vue de Monde held a food and wine tasting there recently. Chef Simon West uses local suppliers extensively and the menu, which changes daily, offers casual, but refined, sophisticated food. The paintings and the sculptures combine with the natural beauty of the place to make it a lovely way to spend an afternoon in a vineyard. It’s only a 50-minute drive from Melbourne on the M11 but the contrast with the bustling traffic is immediate. The gates of Yabby Lake open onto a silent, peaceful vista of rolling hills covered in vines – vines protected by nets in this season. The drive to the winery and restaurant is through a long avenue of tall eucalyptus trees, which give a distinctly Australian aspect to the rows of vines on either side of the road. These tall trees look as if they have been here forever, but they were planted by Mem Kirby as small saplings. If you are lucky, you might spot a kangaroo between the vines. Kangaroos are not usually associated in our minds with vineyards, but apparently wine and kangaroos cohabit very comfortably. They don’t often eat the grapes as they prefer the grass that grows between the vines. The significant new addition to Yabby Lake this year is the opening of the winery which was constructed not far from the Cellar Door. Now tractors are able to deliver the freshly hand-picked grapes a short distance directly from the vineyard into the winery, rather than being pressed at a distant site. WomanGoingPlaces was the first to film the pressing of the grapes in this new winery. The grapes are dropped into a huge, highly sophisticated de-stemmer that removes the stems from the grapes by gravity. The grapes are never pumped or handled in a way that can damage them. New technology for an ancient craft. Australia does not have the benefit of centuries of winemaking, but we are not as new to it as you might think. In fact, when the first British ships were transporting convicts to this land, they also transported grape vines. The first pinot that we know of in Australia, is called MV6 (Mother Vine). It was brought out in 1840 and was thought to originate in France. 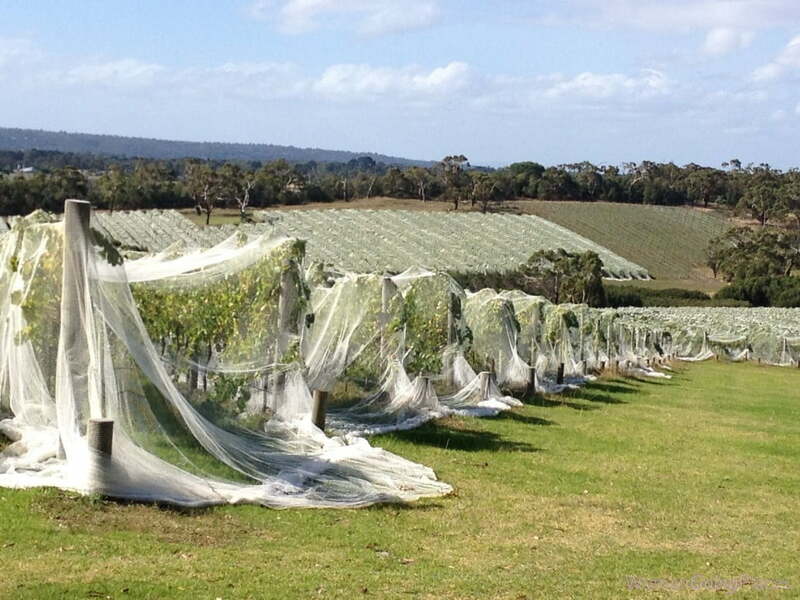 The grapes that are grown today in Yabby Lake are clones of this original Mother Vine. Yabby Lake Vineyard produces single vineyard wines under the Yabby Lake label and from an additional site under the Heathcote Estate label. Yabby Lake’s range of wines includes pinot noir, chardonnay, pinot gris, shiraz and sauvignon blanc. Their wines are exported to major wine markets overseas including to their 5 cellar doors in China. The vineyard evokes an Australian childhood idyll – the summer pastime of searching for yabbies in dams, creeks and lakes – for which it was named. The idyll is still present in the wide bucolic sweep of the place. But the Yabby Lake Vineyard, first under Robert and Mem Kirby and now in the hands of the second generation, Nina and Clark, has developed into an enterprise that is making its mark on Australian wine-making.